Free Shopping Of Rs 350 With Amazon pay Balance – Guys another loot offer coming from amazon.in, where you can get Free Rs 350 cashback On Amazon Shopping of rs 1000 with amazon pay balance offer. Hope you all are enjoying our Free Recharge Tricks and earn Free Paytm cash regularly. Now this time to save money on amazon shopping. 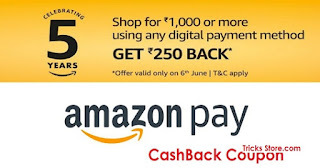 Amazon best cashback offer – Guys amazon is celebrating it’s 5 year in indian digital market, & on this occason amazon is giving cashback on shopping. 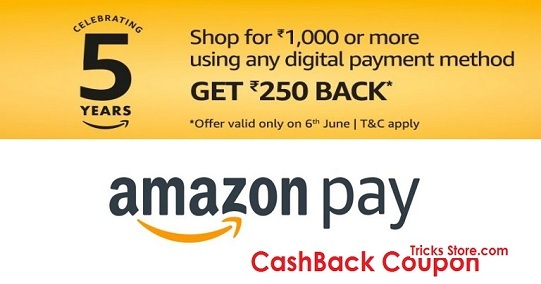 You will get Rs 250 cashback on Rs 1000 amazon shopping with any digital payment method. You can earn free recharge cashback with Amazon Pay Balance on your 1st Prepaid mobile recharge, you will get cashback upto Rs 50 on mobile recharge. Last month we posted Amazon Shopping Cashback offer to Get Rs 50 Cashback on Rs 250 , hope you enjoyed it too. 2. Now login/ sign up on Amazon. 3. Now first add money to amazon pay wallet first – Click Here to ADD MONEY. 4. Now shop with amazon of Rs.1000 or more. 5. When you will going to payment just select amazon pay balance for payment. That’s it guys, you will get extra Rs.250 Cashback on Your Amazon Pay Balance with in 3 days after shipping of your product. * Place an order for a minimum of Rs.1000 and pay through credit card, debit card, net banking, UPI, EMI or Amazon Pay balance, and get Rs 250 cashback as Amazon Pay balance. * The Offer is available from 6th June, 2018 00: 00:01 am to 6th June, 2018 23:59:00pm only (“Offer Period”). * The Offer is only applicable if you place a single order for Rs.1000 or more (excluding delivery fees, gift wrapping fees) on Amazon.in, Amazon Now (Site or App) during the Offer Period. * Any cancelled order(s) or part cancellations that reduce order value below Rs.1000 will not be eligible for cashback. * The offer can be availed only once per customer during the offer period. * The applicable cashback amount will be credited as Amazon Pay balance within 3 days of shipping. Cashback will be credited in parts as and when the products are shipped.